On July 13 of this year, ArtPlace (a public–private collaborative) announced the winners of ten million dollars in grants (no small change in the current climate) for projects that go under the title of “creative placemaking.” From a tiny fishing village in northern Alaska to urban clusters in San Francisco, Atlanta, and Boston, this noteworthy new trend in funding is designed to make the arts a transformational force in developing and improving communities. You might wonder, as I did, what this has to do with music—it sounds more like a project for urban planners or visual artists. But the folks at ArtPlace are hoping that the performing arts will become a central part of creative placemaking, so much so, that they convened a group in 2014 to address the challenges of connecting performance to place. It’s all part of an arts education world that is changing and shifting under our feet. Arts education has most often been about art for art’s sake and community arts has been about social improvement through the arts. All of this change is creating a whole new set of opportunities for musicians, and so, especially as a musician/teaching artist, it’s important to understand what’s going on. There are two worlds colliding, shifting, and finding new formations with one another. The two worlds are school-based arts education and, what writer Arlene Goldbard calls, community cultural development. The first distinction is simple enough—one takes place primarily in schools and the other takes place in the community. But there are more fundamental differences. Generally speaking, school-based arts education has been carried out by teachers in collaboration with artists, often funded by cultural organizations with missions that focus on arts learning. Community cultural development, on the other hand, has usually been carried out by independent artists and local political bodies—a more grassroots approach—and their missions have centered on community vibrancy and improvement. To put it another way, arts education has most often been about art for art’s sake and community arts has been about social improvement through the arts. Over the last fifty years, cultural organizations with national networks like Young Audiences, Lincoln Center Education, and the Kennedy Center have been at the forefront of the school-based arts education movement, blending a variety of approaches to arts learning. Those include concept-based learning (learning about the building-blocks of the artform), aesthetic education (focus on the perception of artworks), arts integration (learning about other subjects, for example math or history, through the arts), and skills-based learning (in music, learning to sing or play an instrument). All of these types of learning put the artform first, and they assume the learners will benefit from their contact with the arts. In community cultural development, there may be structured arts learning in the mix, but the primary objective is community improvement. The arts are put at the service of community engagement and the expected outcomes are about improved communication, job training, or better housing. Sometimes those outcomes are achieved through oblique angles and the arts are still valued for all their ephemeral and ineffable qualities, but the focus is on the community, not the artform. Increasingly, over the last few years, teaching artists have been crossing back and forth over the borders between these two worlds. Community artists have been working more in schools— in the case of music, this has often involved working with spoken word and hip-hop performers, whose talents for engagement and invention are highly developed and sought after. And teaching artists, more experienced in schools, have been working in community settings doing project-based work. This promises a new kind of diversity in arts education, not just in who populates a project but in how it is carried out. It also means that the mission of the work may be different from what it has been in the past. The mission itself may become a fluid, dynamic element in arts education. That creates a potential for destabilization but also for exciting growth. It is not without its wrinkles, though. Many community arts practitioners wonder where the teaching artists from schools have been all this time and why they are now wading into what was the community artists’ ecosystem. 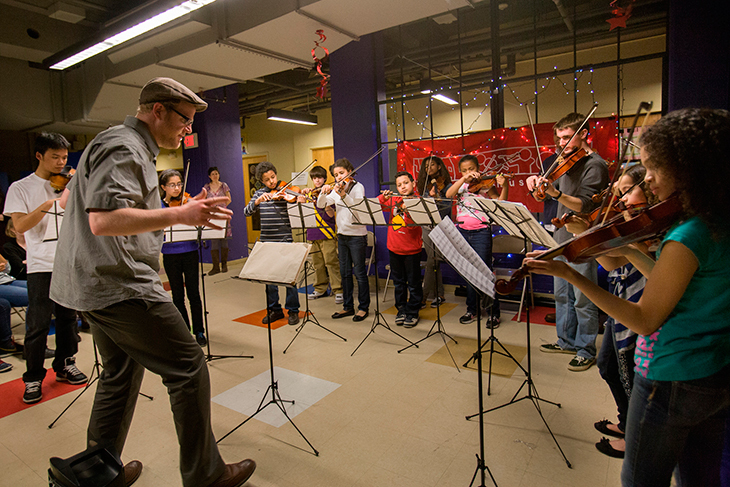 Do teaching artists really understand the idea of community engagement? Or are they just in it for the convenience and the way it supplements their income? And on the other hand, teaching artists wonder why they can’t provide all the music services in schools and why community artists need to be drafted in to make the work more hip. Musicians are finding ways to share time and space, but it isn’t always easy. Our mission is to create a cohesive urban community through music education and performance that transforms the lives of children, families, and musicians. You will note that the first words of the statement above are not about music learning but about creating a cohesive community. That’s a crucial difference. When the term “music education” does enter the sentence, it is in service of creating community, not for the sake of music education itself—creating community through music education, not the other way around. How does that translate into the work of teaching artists? First, it does not mean that musicians are suddenly devoting all their time to planting gardens and painting murals. They are teaching the skills of playing instrumental music and preparing for performances and concerts of various kinds, just as any ensemble would. But it also means that in order to build relationships among the children, families, and musicians, there needs to be ample time to reflect on the process and celebrate successes. Community cohesion requires attention to students’ whole lives, so there is time to do homework and get help with it. There is time to learn about the paths to college and music beyond the high school years. There is time to eat together—Ruth is fond of saying that if you want a community to come together, then you need to feed it. Even the way that a communal supper is created becomes a project to promote cohesion, through sharing recipes and dishes that speak with cultural richness. The genesis of Community Music Works was a professional string quartet and the classical repertoire remains an important part of the training in Providence. But the community has stretched the musicians, too. In 2013, Community Music Works commissioned Venezuelan composer Gonzalo Grau to compose a new piece that had a specific set of questions in mind. Ruth says: “Could the Latin music that many Providence Community Music Works kids hear at their family homes mesh with classical forms? What if we tried it? What would it sound like?” The piece that resulted was Fantasia con Guayaba Habanera, and though I have to confess I have only seen and heard excerpts via videoclips, the piece has the effervescent energy of a joyful musical collision: salsa combined with classical forms and dances, ending in a kind of impromptu communal singalong. It is most likely not what the string quartet was playing in its first concerts in the late 1990s. I cite these two examples because they embody the kind of blended work that I think teaching artists do best. Real, rigorous, high-level music learning, combined with social mission. The way that social mission dominates or informs the work may vary widely from one group to another, from one project to another, but it is something that teaching artists need to consider. These musicians and others are pioneers, bringing their professional training into communities that otherwise wouldn’t get the chance to experience its possibilities for themselves. As movements like creative placemaking grow and develop, shouldn’t music and the performing arts be as instrumental to cultural community development as urban design and the visual arts? There are hints of music and theater and dance in this work, but not nearly enough. It’s an area of potential growth, and perhaps young musicians today will be able to see the opportunities and seize them. And to turn things around a bit, wouldn’t it be interesting to think about school-based arts education in terms of creating cohesive communities? The blurring of boundaries can be filled with conflict, but it can also be filled with possibility. Composer Thomas Cabaniss teaches at The Juilliard School. He is host and composer-in-residence for Carnegie Hall’s LinkUp program and has served as music animateur with the Philadelphia Orchestra and as education director of the New York Philharmonic. His music is published by Boosey & Hawkes and MusiCreate.